We offers an extensive line of effective and humane bird spikes for an endless number of applications. Punada premium bird spikes are 100% effective at preventing pest birds from landing,nesting, or roosting on selected surfaces.Control birds such as sparrows,pigeons, starlings, seagulls, crows, blackbirds, grackles,swallows and more.They are easy to use and easy to install. These bird spikes are made of high-quality hard plastic that will not rust.Sections can be glued, screwed or tied down. Ideal for ledges,beams,rafters,railings,air conditioners,signs,windowsills,gutters,roof perimeters,chimneys,support structures,awnings,poles,lights, statues,trusses,building projections and anywhere else birds roost. Bird spikes are an effective,humane and cost-effective bird control solution that will not harm birds. By installing the spikes on surfaces where pest birds like to perch an uninviting, irritating and intimidating barrier is established, forcing them to relocate. What is included: 10 stripes bird spikes. Each stripes includes 5 snap-able segments. Click "Add to Cart" and get these awesome bird spikes now! We stand behind our products and services. For any reason, if you are not completely satisfied with your purchase, contact our customer service at 570550382@qq.com or return these bird spikes within 30 days after delivery for a prompt refund or new replacement. Rest assured that you are always getting the best from us. ★16 FEET COVERAGE FOR DIFFERENT SURFACE.BARELY VIDIBLE:The box comes with 9 spikes which covers14.85 feet. They are a good size and you can combine as many as you want to cover the beam/roof/fence. Punada bird spike strips are the perfect width(1.7")to lay across the top support board of the fence .These brown bird spikes aren't really noticeable at all from the outside of the fence. You don't need to worried that the spikes would take away from the appearance of your lovely fence. ★HUMANE BIRD DETERRENT WITHOUT THE CONCERN OF BODILY DAMAGE:The Spikes for birds are made of durable hard plastic. They are pointed and rigid enough to caused discomfort but not enough to caused harm to animals/people or injure them. When the birds, cats,dogs,raccoon,squirrels and other critters attempt to land where they used to perch, Punada bird deterrent spike will make them extremely uncomfortable. Perfect and inexpensive solution to your security issue. ★100% MONEY-BACK GUARANTEE:Your satisfaction is our top priority and we are confident you will be pleased with our product and service. Still, if you can try us and decide your purchase does not sufficiently meet your needs, you can contact us at 570550382@qq.com for full refund or a new replacement within a month. No risk purchase here. We strive to offer you the best after sale service. ★BEST SOLUTION TO KEEP CRITTERS OFF YOUR FENCE,ROOF: No more serious bird problem making noise and crapping all over the place. No more raccoon，cat activity on the roof . 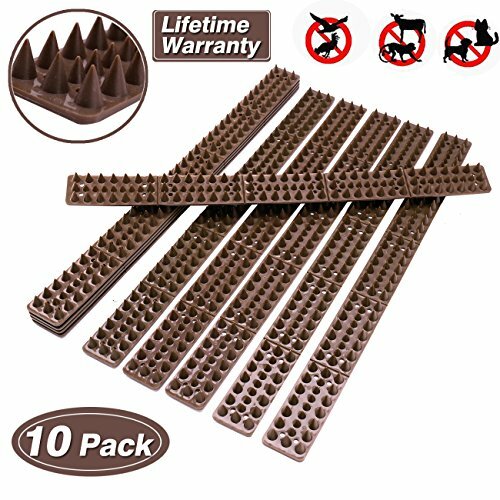 Punada Anti-bird spikes prevent all size birds,children,burglars and other intruders from climbing on your fence.These bird spikes keep raccoon from using your storage shed roof as their personal outhouse.These bird spikes kit also work very well indoors to keep your dog from bracing itself with its paws on a window ledge. ★PUNADA BIRD REPELLENT SPIKES ARE EASILY INSTALLED WITH SNAP-ABLE SEGMENTS:These plastic bird spikes are easy to fit in the space because they come with easily snap-able segments.You do not need a saw or anything else to cut them. You can just snap them into shorter pieces so that areas can be filled in. The strips are much easier to set up than others .You can put these anti bird spikes up and screw them in place with nails/screws or secure the strips with strong zip ties/double velcro tape.